Researchers from Leiden University in the Netherlands have visualized how atoms behave in between graphene and a substrate, which could be instrumental for future implementations of industrial graphene production. A basic idea for large-scale production is heating silicon carbide to almost 2,000 degrees C, and a graphene layer grows on its surface. 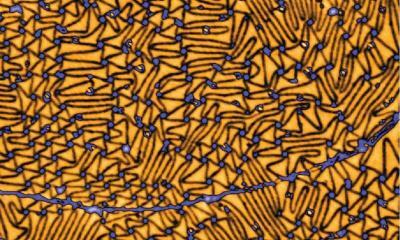 However, researchers need to make sure that the desired properties of the graphene are not disturbed by the substrate. Inserting hydrogen atoms in between the graphene and silicon carbide isolates the graphene and leaves it intact as a single-layer material. Physicist Sense Jan van der Molen and his research group at Leiden University have visualized for the first time how those atoms behave underneath the graphene. The researchers used a low-energy electron microscope (LEEM) to study what happens to hydrogen atoms sandwiched between graphene and silicon carbide. They spotted lines where the graphene layer is strained. The hydrogen atoms use the lines as tunnels where they can escape more easily, whereas they stay put much longer under the graphene's smooth regions between these lines. "The reversed process is widely used in research to decouple the graphene from the substrate," says the team. "But it was not clear how the hydrogen moves at the interface. We could show that hydrogen gas can be blown into those tunnels so that it will spread quickly underneath the graphene layer in the form of individual atoms."